From its historic past to its artful present to its tech future, Old City is the place to be! Look for vibrant and diverse offerings that make the neighborhood the historic gem of Philadelphia. Mark your calendar, tell your friends and come prepared for a festival unlike any other. For a full list of activities, vendors, schedules and other information, see below or visit oldcitydistrict.org. * The biggest music line-up in the festival’s history, featuring Chill Moody, West Philadelphia Orchestra, Worldtown Soundsystem, plus DJ sets by Philly’s own turntable wunderkind DJ D-ILL! *Two fashion shows featuring the latest Old City trends in clothing and hair, curated by Barnet Fair hair salon! *Notable new names join the restaurant line-up including Barry’s Buns and Prescription Chicken of The Bourse Food Hall, Nauti Mermaid Crab House, Tomo Sushi + Ramen, and more! * Look for Philadelphia’s Historic District, a returning sponsor, to make a lively splash along Arch Street during Old City Fest, bringing lots of activities to the annual autumnal celebration! *Two new circus performances and a new magician join the festivities at the Family Fun Zone presented by Toyota! *Eight new vendors join Independents Row, a special designated area featuring local makers! · Large cinnamon rolls, mini bun cup, sticky bun parfaits, crumb cake, pumpkin crumb cake, brownies and chocolate dipped liege waffle with Fall jimmies. · Scoops of ice cream in cups and cones (including the Sea Salt Caramel and Pumpkin ice cream), as well as ice cream sandwiches and our keystone-shaped ice cream bars from the Franklin Ice Cream Bar. DJ Royce will spin music live on stage throughout the day. Look for performances by Chill Moody, West Philadelphia Orchestra, Worldtown Soundsystem, plus DJ sets by Philly’s own turntable wunderkind DJ D-ILL! Ran’D Shine is the face of the new millennium magician. He wowed audiences with his brilliant presentation at the 44th Presidential Inauguration in Washington, D.C. as well as Capetown, South Africa. As one of the most sought-after college performers, he has also captured the imaginations of audiences from Hollywood to New York City for more than a decade. He has already read your mind and knows that you want to know more. Come see for yourself. 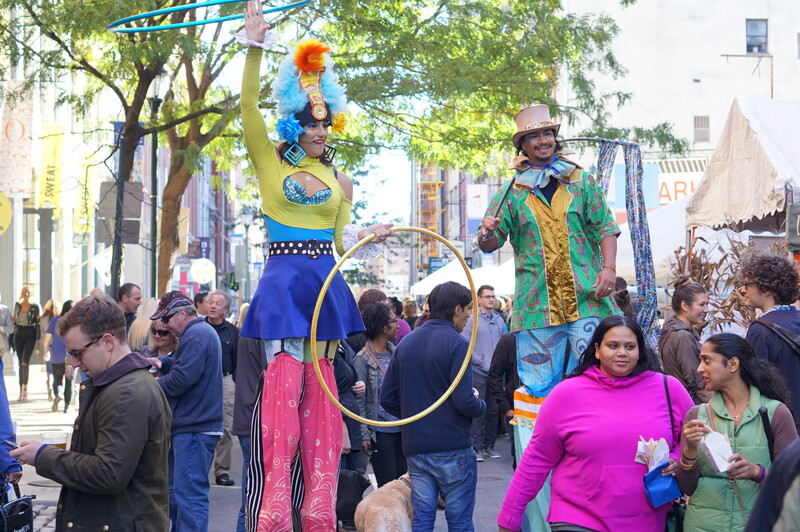 Look for Philadelphia’s Historic District, a returning sponsor, to make a lively splash along Arch Street during Old City Fest, bringing lots of activities to the annual autumnal celebration! Come out to watch The Clay Studio’s Wheel Battles as two artists at a time compete head to head on the potter’s wheel in competitions throughout the day! For more information about Old City District and Old City Fest, visit oldcitydistrict.org, or call (215) 592-7929. The Old City District is a special services district, managed by a board of directors drawn from area commercial property owners, business people and civic organizations. Located in the most historic square mile of the United States, Old City is a unique blend of historic influence and modern lifestyles. Old City has reinvented itself from foundries, factories and warehouse spaces into the residential, retail, dining and cultural destination of the city with art galleries, restaurants, and upscale retail boutiques and historic tours. www.oldcitydistrict.org.